It had to happen really. Following DC's total relaunch of all of their titles - well, 52 of them at least - last year, Marvel have officially confirmed that they are doing something a little bit similar. Called Marvel NOW! (presumably the capitals and exclamation mark are significant in some way) very few actual facts seem to have been revealed, although there are plenty of rumours. From what I can gather (and I may be wrong), Marvel are going to launch or re-launch 20 or so titles between October 2012 and February 2013. So far three of those titles have been officially announced: 'The Uncanny Avengers' (featuring the "best of the Avengers and the best of the X-Men", another re-lauch of 'Avengers' and 'All-New X-Men' where the original X-Men travel from the past to the present and don't like what they find. - Black seems to be the popular colour this season with Spidey, Thor and even Iron Man sporting black in their costumes. - Why does Thor, who is rarely seen without a hammer in his hand, need TWO swords? Will he be gaining an extra arm at some point? My other thought concerning the re-launch as a whole is: will this actually achieve what Marvel want? Which is presumably a big hike in sales to rival or, preferably, outsell DC. While I'm sure that there will be a lot of interest generated in this, I can't really see it matching the interest that was generated in the New 52. The main reason for this is that Marvel is a company that has regularly re-launched and re-vamped its core characters and titles. Captain America, Thor and Iron Man have all been relaunched two or three times in the last 10 years alone. 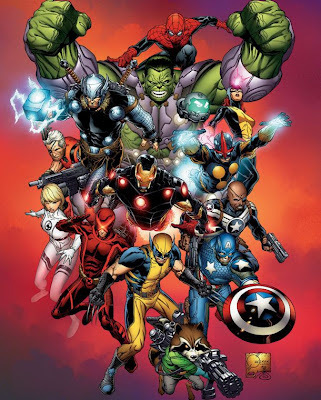 Several of the X-Men have recently been re-launched as have some of the Avengers titles. Will one more re-launch, even with the added attraction of new costumes be that much of a big deal? At least when DC re-lauched the likes of Action Comics last year it was the first they'd done so in over 70 years. It actually meant something. I'm not sure the same can be said of Marvel NOW! That said, some of the ideas behind the titles that have already been announced sound very interesting and that alone could be enough to make me pick up a Marvel title for the first time time in about two years. Which I suppose is what this whole thing is all about really - getting more people to read their titles. But if Marvel are expecting the same kind of response to Marvel NOW! as the New 52 received then I think they might be disappointed. And then it might become less a case of Marvel NOW! and more like Marvel What Do We Do NOW?